A special moment in my household and i am on the road – in Birmingham, actually, at the Custard Factory. This is where i taught last year on Yeast and the Kingdom. So . . . what event of familial importance took place today? Not a birthday. . .
no . . . today my little boy got his first mohawk . . oohhhhh ahhhhh . . . i’m soooo proud of him. ahhhh look at him. isnt he cute? 15 years old and all conformed into scottish youth culture. Sam the mohawked man will be going with his friends to the Muse concert in Edinburgh. and he did not want to go camping today because the youth alpha course finishes on sunday. good on ya sam! related; Max [marko’s son] got a mohawk also. Everyone needs a mohawk at least once in their lives. Nice mohawk, although I must say I like a deathhawk better. 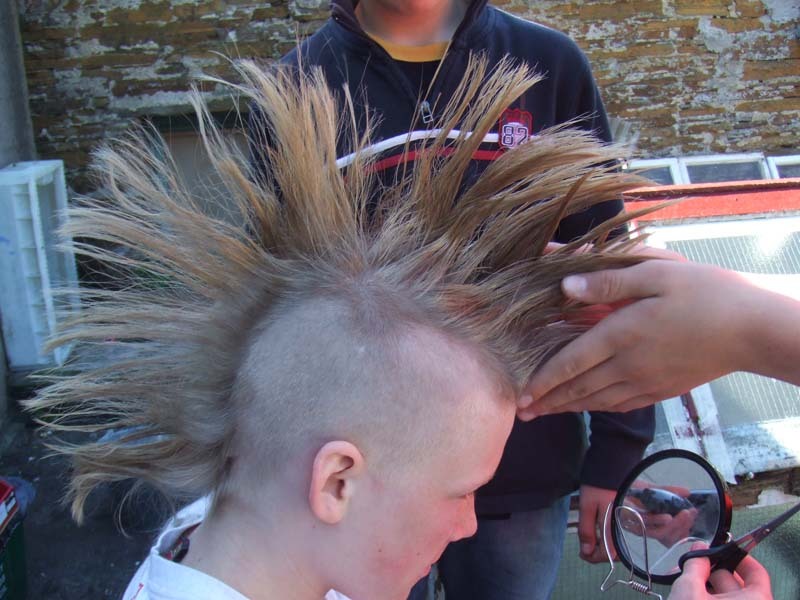 My parents would never let me get a mohawk–how unfair. yeah, my wife would poop if my son gave himself a mohawk. I would like to think I would help give him one when he is ready, buy I guess that is a rite of passage you do with your friends and not your dad. I just cut off my Kimball and my Crowder to passify the wife so I could look proper when I sing in a couple of weddings this summer. Yeah… I look forward to my child’s first mohawk – or whatever the equivalent is for her generation. BTW she’s 3 at the moment. oh wow. that is pretty freaking awesome. did you say you cut off your Kimball and Crowder???? Authenticity is not as simple as a haircut, clothing style, or even drinking the right cup of coffee. It comes from Living the Truth even when the rest of the culture is (in Václav Havel’s words) living within the lie. hope you dont mind me standing up for my son, his motives, and the truth of the situation. this is not an accuarate handling of the truth. please. we should be above reproach in these matters. you should go easy on my son – he has a missionary dad who is not around for much of the time and is part of a missionary family – he has made great sacrifices for the gospel that most kids never have to make – he has grown up in a family that choose following their call in christ overseas rather than staying home to have a career and a cushy life with lots of toys and security. he could be angry that he does not really have a home or does not live near his old friends – but he is not. and i respect him for that. sam is a spiritually senstive young man and has always – trendy or not – expressed his journey through his fashion. plllluuuzzzeee dont tell me that was trendy because it wasnt – we were a little embarassed at times, especially when he was not allowed into shops with his bare feet. when he was about 8 he let his hair grow like the jewish young men that he read of in the old testament who loved god. now he is 15 and i am proud that he can still express himself and his walk with jesus. i have a concern with christian parents who insist that their sons maintain the hair-cut of a 1950’s 6 year old boy throughout their teens and beyond. Any advice on convincing parents to let you get a hawk? My dad said i could get one if I convince my mom and im trying to think how im gonna do that. Use Egg Whites They Keep Your Mohawk Up.